Ouargla, Africa – Washington Post promotes another potentially bogus “all time high” temperature record | Watts Up With That? From the “anything hot goes” department and the Washington Post’s Capital Weather Gang comes this pronouncement of an all-time high temperature record that may be little more than wishful thinking, much like the recent all time high in Scotland that turned out to be polluted by an idling vehicle producing hot exhaust near the temperature sensor. It started with this tweet Friday 07/06/18: (h/t to Mike Bastasch of the Daily Caller). The planet’s hottest continent probably just endured its hottest weather ever reliably measured. Ouargla, with a population of nearly half a million, is located in north central Algeria, roughly midway between Morocco and Tunisia. Its 124.3-degree temperature surpassed Africa’s previous highest reliable temperature measurement of 123.3 degrees (50.7 Celsius) set July 13, 1961, in Morocco. First, the keyword here is “reliable”. More on that below. Second, the record is unverified as of this time. While the Synop data and data captured by Weather Underground both say it reached 124.3F (51.3 C) Thursday afternoon likely between 3PM and 6PM local time, it seems that even though this claimed record is being built up by WaPo as “big news” it has some real problems with it much like the rejected Scottish all-time temperature record. Note that the 51.3C Tmax reading doesn’t show what time it occurred, but we can surmise based on surrounding data, likely sometime between 3PM and 6PM local time. Note also the winds during that period. “Although the measurement appears plausible given the weather conditions that day we cannot rule out the potential for contamination of the measurement by this non-weather-related factor,” officials wrote. So, the issue was siting. Turns out it was an Ice Cream Truck parked nearby the station. Temperature was measured in the wrong place where an unexpected bias creeps in. Third, The Algerian Met Office doesn’t seem interested. In the case of Ouargla you’d think the Algerian Meteorological Office HQ in Algiers would at least have a mention of “probably the highest temperature ever reliably measured both in Algeria and in all of Africa.”…but, they don’t. Either they are unaware, or don’t think it’s meteorologically/climatologically important. What I found below in #5 may be why they aren’t touting it. Ouargla Airport (OGX) now known as Ain Beda airport (ICAO code DAUU) Location of the terminal and Algerian Air Force Base are marked. Here’s the closeup of the civilian section of the airport. Airports are NOT good places to measure climate change or even record highs/lows. Why? they are dynamic places; jet exhaust, changing infrastructure, and constant energy use. Just look at the small area for the jet above, it has to make a 360 rotation and that spews jet exhaust everywhere.Does it affect the temperature sensor? Who knows for sure without a flight schedule to compare to the temperature record, but if the Met Office can disqualify an all-time high temperature record for an Ice Cream Truck parked nearby spewing exhaust, you’d think meteorological authorities would want to look at whether jet airplanes are doing the very same thing at Ouargla Airport. So for all we know, since we have no Google Earth imagery past March 2018, the airport may be torn asunder, darkened earth may be exposed, changing the albedo, and therefore the ground influenced air temperature in full sun, or the thermometer may be moved and compromised in other ways. We won’t know until we get some on-the-scene photos. Sixth, based on the location of the AWS (automated Weather Station) temperature sensor in March 2018 and wind data, the all-time African high temperature record may be a product of poor placement, wind, and heat transport (or jet exhaust). Ouargla airport – best candidate for the automated weather station. Click to enlarge. It’s near the terminal and admin building – shorter wiring distances to where the data is needed. It’s a public facility, with public reporting of weather data, not a military weather station, so it makes sense it would be closer to the public area. It is positioned in the runway approach area and is fenced in to keep people away. AWS are used for runway conditions, not climate, so makes sense where it is placed and fenced. The tower is about the right height for an AWS, typically 10 meters (30 feet) for the anemometer/windvane, and the temperature sensors are almost always close to that sort of tower because they want all the readings at the same place. Nothing else I observed in the entire area fits the bill for an AWS tower. Most all others are too tall. So let’s assume that marker is the location of the AWS. Note that at 2PM the temperature was gown down, but at 3PM it hit 122F (49.9C) and at the same time there was a wind shift to the WSW SSW with average wind of 15mph. 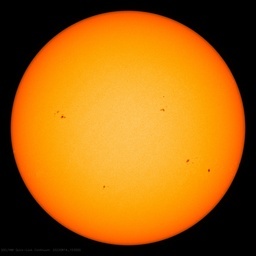 3PM is also about the time to expect peak solar insolation for that location, which leads to maximum ground heating. Assuming I have the AWS temperature sensor placement right, guess what is upwind of the AWS when the wind is coming from the WSW SSW? One thing is for certain, with that wind direction, there was most certainly heat transport toward the AWS from the tarmac and terminal. I don’t know if there was a jet plane present and taxiing at that time or not, but if there was, the jetwash would add to the heat transport. I believe that the Ouargla “all time African high temperature record” is based on artificial heating sources and heat transport by wind at the opportune moment and best direction for heat transport from the airport tarmac and/or jetwash. I also submit it has NOTHING to do with global warming/climate change but is little more than a combination of a warmer than normal meteorological synoptic-scale event for the region, combined with poor thermometer placement and a wind driven heat transport event. In my view, this temperature record should be disqualified as being influenced by man-made objects, just like the Ice Cream truck parked next to the weather station in Scotland. I welcome comments, and if anyone can get an “on the ground” confirmation of my theory, such as photos or videos, please share it in comments. One final note. NASA GISS uses this station as part of the GHCN (Global Historical Climate Network) data provided by NOAA. After looking at the fractured record, and the above scenario, any sensible person would ask WHY? Moral of this story: We shouldn’t rely on airport weather stations for anything to do with climate records. They are placed for aviation purposes, not for climate purposes, and are active energy sources, heat sinks, and unnatural/artificial terrain that is unrepresentative of the area’s climate. UPDATE: A day after this post was published, a typo was noticed in the wind direction in the text (should have been SSW, not WSW) and was corrected in both the post body and the image with wind direction. The typo doesn’t change the conclusions of the essay. July 7, 2018 in Weather_stations. It’s also NOT a record. Neighboring Libya has reported temperatures of up to 136.4 F ! I’ve been in Upper Egypt at 50C during the summer – not that unusual, and not near an airport. IIRC, that Libyan record was withdrawn decades after it was reported. Apparently the substitute observer read the wrong end of bars that record the max/min temperature. I’ll hunt down the WUWT post in a bit. It’s all just a bunch of hot air anyway. Here ’tis. Ironically, courtesy of Jeff Masters. Today, the official arbiter of Earth’s weather records, the World Meteorological Organization (WMO), announced that the all-time heat record held for exactly 90 years by El Azizia in Libya “is invalid because of an error in recording the temperature.” The WMO committee found five major problems with the measurement. Most seriously, the temperature was measured in a paved courtyard over a black, asphalt-like material by a new and inexperienced observer, not trained in the use of an unsuitable replacement instrument that could be easily misread. The observer improperly recorded the observation, which was consequently in error by about 7°C (12.6°F.) The new official highest hottest place on the planet is now Death Valley, California. A remarkable high temperature of 56.7°C (134°F) was measured there on 10 July 1913, at Greenland Ranch. That post continues on with a 2002 essay by John Daly about other attempts to discredit long standing high temperature records, focusing on efforts at Death Valley. I’ve never heard of an attempt to discredit old cold temperature records. I seems that if he read the wrong end of the for the high temp then he would have done the same for the low temp. I wonder if there’s any evidence of that? Working in an extreme environment drastically increases the chances of human error. That said, most other sources of error would be on the high side. I can’t think of something that would make a properly calibrated thermometer or sensor read low. Check out the AMS paper at https://journals.ametsoc.org/doi/pdf/10.1175/BAMS-D-12-00093.1 . You can zoom in on the ledger page and read the data, a fine feature. The min temperature, read at the wrong end of the bar, would also be 7° low, the text seems fairly willing to accept the data that was recorded. The max/min thermometer was not the typical NWS pair used in the US, but one with a U-shaped tube. Given other errors, like using the wrong columns for max and min, the authors conclude operator inexperience (I’d add inattention). I wouldn’t expect consistency in making errors. In addition, beginning on 11 September 1922, the maximum temperature readings increase dramatically, while the minimums continue more or less within range. So perhaps the mins were recorded accurately. As noted by Fántoli (1954, 1958), the temperature observations were made over a concrete-coated plaza of a small military fort on a hill. The plaza coating of tarred concrete could accentuate surface heating beyond the norms for a natural desert environment. After the instrument shelter in El Azizia was relocated in 1927, only two other temperature readings above 50°C (in the ensuing 48 yr of record) were measured at the site. There were anecdotal reports here a few years ago that recent record lows at Amundsen–Scott South Pole Station were adjusted upwards by BEST because they were not believed based on temps at McMurdo Station. McMurdo is at sea level on the coast while Amundsen–Scott is well inland on the ice at over 9000 feet. There have also been anecdotal reports that observers in the colder areas of Russia during the old Soviet days would routinely fudge temp records down because heating oil there was rationed based on temperature. I have no idea if these reports are true or not, but if they are and if the old Soviet era records are included in the global average temp calculations (Amundsen–Scott is) the net effect would be to increase the apparent warming since Siberia would have actually been warmer than reported in the 50’s-60’s and Amundsen–Scott would be colder recently than reported. I don’t think they are talking about world records. They’re talking about record temperatures at a particular location. since it is invisible to sunlight? and a new long-term cooling trend begins. should have the least effect. get adjusted more than once too ! good enough for real science. Good one! Made me laugh. at your minimal knowledge of climate science. to learn a little about climate science! so they couldn’t be wrong! is known as the boundary-layer. just a few hundred meters. During the day it grows to a few kilometres. much more sensitive to warming than the day. in the boundary layer that gets warmed. when measured near the ground. during the last fifty years. needs a lot more work. Why would anyone listen to government bureaucrats for their information about climate science? As I understand it (in a nutshell), sunlight hits the Earth, warms it, and the heat radiates back into space. Because the GHGs (principally water vapor, CO2 and methane) absorb and emit long-wave radiation, the heat from the Earth is partially trapped by the atmosphere. Daytime (and nighttime) temperatures are affected by the GHGs and the strength of the radiation from the sun (a function of the distance between the sun and Earth, the angle of the sun’s rays when they hit the Earth, cloud cover and the sun’s activity). I’m leaving a lot of the details out here, but let me know if I’m mistaken here (unless you think AGW is wrong – in that case, don’t bother). Assuming I’m right, I fail to see why CO2 wouldn’t affect daytime temperatures. What do you mean by “real time”? The instrument record? Do you believe proxy measurements are not representative of temperature change? I suspect (but don’t assert) that a warming trend beginning in the 19th C could have been partly a product of deforestation and subsequent burning. Infilling of temperatures is not a matter of guessing, it’s done statistically. Imperfect yes, but nothing like guessing. Sure, measurements are adjusted! It would be extremely negligent if they weren’t, since there are known inaccuracies in the record. Again, the problems are (often) found statistically, adjusted statistically and validated statistically. Sometimes the adjustments are checked by an independent group. When there was all the hubbub about the adjustments made by Karl et al., contrarian scientists agreed that if Berkley Earth reanalyzed the data and found that it was kosher they would accept it, but that didn’t stop skeptics from their accusations of fraud. Nor do skeptics care that the methods used by McKitrick and McIntyre have been shown to have greater problems than the Mann et al. paper they were *trying* to damage. It is this kind of blatant bias and lack of scientific integrity and professionalism that I find a major weakness in the credibility of the skeptic position in general. Given my inability to analyze most results of climate research personally, bias and credibility are important factors. ALL scientists are subject to bias. The question is how much it affects their research and conclusions, and how those conclusions are conveyed to the public. You are right, Richard, that I am no expert in climate science. I know far less than some others here, and have never hidden that fact. I understand that people may laugh at me – fortunately I can laugh at myself, too, upon learning of my blunders. However, this is a matter of knowledge, and it doesn’t always take knowledge in order to identify errors in reasoning, which is what I generally try to concentrate on. I also know something about the practice and philosophy of science, and a bit about statistics – enough to realize that they are often abused around here. I love to learn. I know very little about the boundary layer, and appreciate you bringing it up. It was a prod to learn a bit more. I don’t appreciate Us vs. Them mentality, insipid suggestions that mental acuity is a function of partisan leanings, or insulting assumptions about me, my beliefs and background. Infilling can not be verified or falsified. and would prefer their predictions to come true! in a coming climate crisis. not real science — especially wrong predictions. websites disappear within one day. allows you to comment without censorship! Thank you. You don’t have to feel guilty, though. I can come off poorly myself and make generalizations and assumptions that aren’t correct. I’m trying to do better and be more diplomatic. We’re all human! Looks like they went for a extended shisha-hooka smoke in 1970. Suddenly in 1997 they woke up to the fact that there was money to be made in higher temperatures, and so they bumped up the readings by 2 degrees. Baksheesh, baksheesh…. And subject to continuous expansion & development. The larger the number of missing data points allows the software to insert more fictitious temperature readings into the calculations which are biased to show global warming. The use of temperature readings placed at airports show that airports are increasing in size, number of passengers and use of jet engines. They have nothing to do with global temperature. As far as I could check on flightradar24, there were arrivals and departures on 05. Jul. 18, but they do not fit into the time slot around 15:00 lt. These were civilian flights, but the military might have had aircraft operating during that period. Absolutely. No matter what was going on, the Algerian military won’t tell. They are said to be awfully particular. Time to display my ignorance . . . is there a list somewhere of “Gold Standard” weather stations . . . ones that are least likely to deliver contaminated results? Preferably, too, that they have decades and decades of records that can be examined? Nick Stoke will be along to say there is nothing to see here, move along in 3…2…1! AACK !! You were off by 20 minutes !! LOL ! Exactly what did he say that you object to? All he did was make some distance measurements. Perhaps you think it would be better to consider this issue without knowing such things? Nick always come along as states that these are outliers and are not in various datasets. It’s not the point. The point is the MEDIA reports them and people believe the reports whether it is relevant to the climate debate or not. Nick is ALWAYS on the side of alarmism. Nick isn’t the media. He doesn’t do his science with media reports. Is he right about these sites being outliers and not in various data sets? What more do you want from the man than to explain what he thinks and why? Does he have to pass an ideological purity test by yelling loudly about things you don’t like? Of course the MSM didn’t report global temperatures dropped the fastest “in recorded history” over the last two years during a double La Niña cycle. Last winter, many global cold temperature and snowfall records were broken, but were virtually unreported because these didn’t fit the Leftist narrative. Below is a Google Maps version (click to enlarge). I marked with a red ring the point where I thought the marker was placed, though I couldn’t see a structure there. Then with the 10m scale bottom right, I did some pixel arithmetic in Paint (1m = 7.8 pixels on my screen). It seems that the nearest point on the airport tarmac is 92 m away. But that is a taxi area, and it is unlikely planes would come close to that corner. The nearest point on the road was 38 m away. These seem to be not so close. Real distances will be larger, because the photo is not from directly above, and I’m measuring as if it were. Or, in other words, it is not up to WMO standard for a Class 1 station (“At more than 100 m from heat sources or reflective surfaces (buildings, concrete surfaces, car parks, etc”). Given the structures to the left it is probably not even a Class 2 station (“At more than 30 m from artificial heat sources or reflective surfaces (buildings, concrete surfaces, car parks, etc.”)), so it is most likely a Class 3 Station “additional estimated uncertainty added by siting up to 1 °C”. See those dark rectangles in the lower left corner? Those mark aircraft parking places for doing things like engine runups for testing (note the plane parked on one in one of the photos upthread). That whole area is exactly the sort of place they’d park and move aircraft. The other thing to remember is that when a jet aircraft is parked, hot plumes of exhaust come out of the back of the engines at a decent speed. Even at idle, there’s a wide swath of hot air that extends back a hundred feet or so, and longer if the throttles are up. I’ve worked on planes in similar areas, and you can feel the heat from at least a hundred yards away, never mind a hundred feet. The buildings wouldn’t block that much of the heat, either – the wind helps push it around and over them. With a wind boost from that direction, an exhaust plume would saturate the area inside that fence. It is 132 m from the nearest dark rectangle. It will of course be greater for a larger aircraft. …plus a 15 MPH wind blowing in that direction. Even at idle, you’d feel a good extra dose of heat well past the monitoring station. Jet exhaust is 400C, at least (high-bypass turbine at idle), or even more if they’re doing engine tests or getting ready to taxi. If more than one plane is running, the temps downwind will be pretty nasty. This is from personal experience on flightlines in the desert (California). I’ve seen 140+ F measured under shade on a flightline when the official temps were around 110 F.
Of course that SW wind might well have been jet exhaust. I don’t think an anemometer can smell the jet fuel. Nick stokes the faux flames of AGW…..
What a shameless apologist for slipshod ‘science’. Next he will tells us the adverse influence of ‘cooling breezes’ from jet engine exhaust will require ‘legitimate upward adjustments’ to the temperature records for this site. Not too far-fetched. On a recent thread that discussed a 1940s “warming blip” in climate gate emails, he argued the emails were actually discussing a 1940s cooling anomaly. 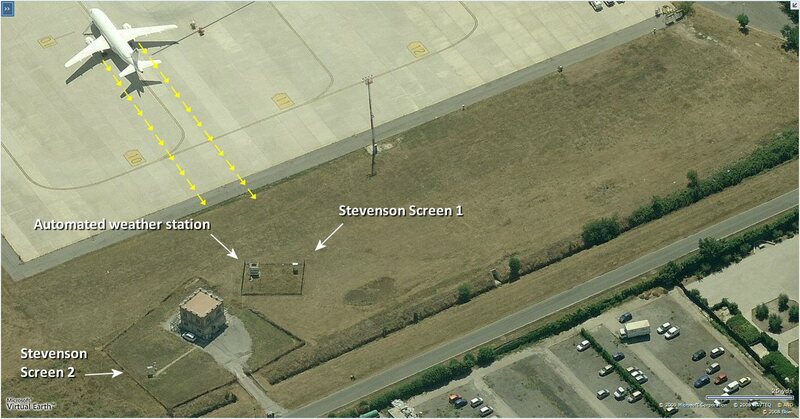 I edited this airport on Wikipedia a couple years ago, but I didn’t have anything on the automatic weather station. I’d go for something a little closer to the runways. The SkyVector chart of the airport will show the current weather reading if you mouseover near the crosshairs. Hi Mike, That’s a representation and I believe the dot that gives AWS was placed by the web designer. It’s at the right end of the runways, but at that scale a pixel or two makes a huge difference. I don’t know how reliable this is, but I heard several years ago from an acquaintance who is a consultant in the oil business (a specialist in directional drilling, no less) and works all over the world, that according to Algerian law public employees are entitled to paid leave from work when the temperature rises above 50 C, and that the Algerian Meteorological Service therefore never reports higher temperatures than 49.9 C.
He also told me that locals at an oil-field in Rub al Khali in Oman had told him that they had once recorded 61 C. The thermometer was in shadow, but he was uncertain how well it was shielded from radiation. Wife used to work in Riyadh, they had the same rule. Never reported any temps over 50C, even though it was regularly exceeded. Well isn’t that just stunning. Data corruption due to local laws creating unintended consequences. I bet these aren’t in the data adjustment tables. Remember Mitribah, Kuwait, 129F July 2016 – hailed as the highest ever NHemi record – now under investigation by WMO. And Iran, 129F June 2017, surprise surprise – Ahwaz AIRPORT. When something supports the agenda, facts/truth/doubt/science just don’t matter. 129 F isn’t even close to NHemi record unless Death Valley (134 F in 1913) has moved south of the Equator. 129 F at Ahwaz doesn’t feel unlikely though, Khuzistan probably has the hottest weather in Eurasia. It can be very bad, been there. By the way I’ve seen 130 F on a thermometer in the Mojave in July, but while at the right height and in shadow, it wasn’t in cage, so it was probably affected by radiation. What was claimed – not what I think. I read Heller too! But we are dealing with history revisionists – as many people have noticed, many inconvenient record temperatures of olde, that happily stood for decades, have been revisited in the global warming era, and suddenly been declared invalid (so that new records can be claimed today a cynic would say). The Death Valley excuse is that the thermometer was pelted with hot sand or something – check out all the records on the wiki page for all the excuses, sorry notes. Hell the Australian bureau just assumes all temperatures before 1910 are wrong and ignores them – that saves explaining all that inconvenient heat in the 1800s. Yeah, The late 1890’s was a time of extreme heat and drought in Australia (“The Federation Drought”), now happily abolished. I expect the 1930’s “Big Drought” in the Midwest will go the same way soon, as the last people who actually lived through it dies off. Most records (hot and cold) are before 1910. Whether they would stand modern checking is another question. Doubtful there was a Stevenson screen at all. No, you are spreading, as is the comment preceding and the JoNova post, simply demonstrated misinformation. The BoM is not suppressing pre-1910 data. You can get it all through the Climate on Line page, for a huge number of stations, and all their records of extremes are based on that, and include all years for which data was ever available, Stevenson screen or not. 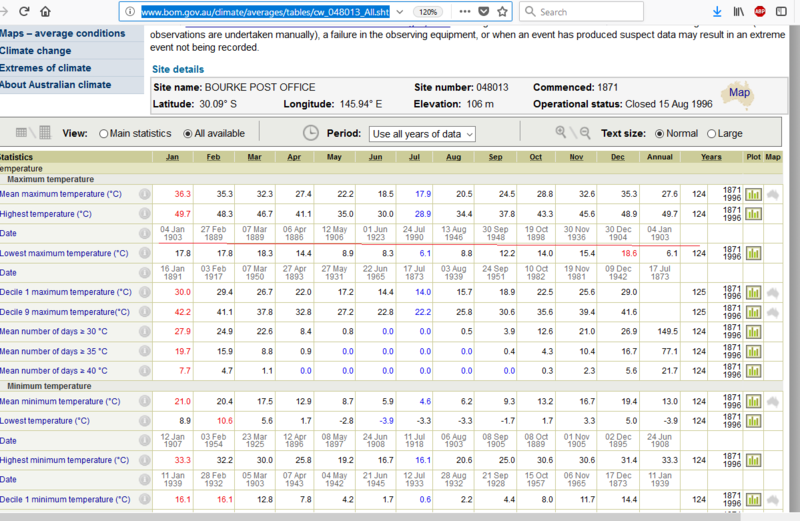 Here, through that page, is a complete set of daily max temperatures in Bourke, starting 1871 (I’ve linked to 1872, but you can select other years, and download all years). The unverified ‘record’ was shouted from the rooftops, immediately used for global warming propaganda. The truth – it appears to be a 10 year old weather station, deliberately placed in what was believed to be one of the hottest places in Kuwait, if not the whole N or EHemi. A very similar reading there was previously disallowed for a faulty sensor. Even if the record is validated – it has nothing to do with global warming, just crafty placement of a thermometer at a regular hotspot identified from satellites, with the aim to capture the record. A similar trick has been used in the UK to identify the wettest places, the environment agency then goes and installs a rain gauge, sits back and waits for very high rainfall or hopefully a ‘record’, and then declares rainfall is getting more extreme. No, they are just getting better at targeting and capturing the extreme instances. Lets see now. A weather station in the middle of the Sahara Desert, near a jet airport, in the middle of summer records a high temperature reading. Gosh. If this global warming thing didn’t exist nobody would think that such a reading would merit any comment. Who in the hell cares about ground temperatures? Are we skeptics going to be reduced to chasing after thousands of bogus ground temperatures created by urban heat island effects like ice cream trucks and airplanes? The only temperature record that matters is the UAH satellite dataset. The lamestream snooze media need to be called on their alarmist trumpeting of “all-time-high” temperatures. They give the impression to the easily-led, and uninformed that “the planet is heating up”. But each time one of these bogus trumpeted reports gets busted, then it all backfires on them. John Q. may be a bit dumb, but he’s not stupid. All these record high temperatures occur in association with very low rh. Of course, nobody in this farcical, pretend science cares about actual enthalpy while they pontificate about warmest whenevers, whatevers. It’s all too stupid to bother with. For what it’s worth, I checked my blacktop driveway yesterday during a partly cloudy day with an IR thermometer and it read 149 F. Ambient temp was ~ 90 F with 5 – 10 mph winds. Was hot on my bare feet! Just a little thought with regards to the radius roof on the assumed aircraft hanger. It is reflecting some of the sun towards the site of the weather station as can be observed from the angle of shadows in the pics. Probably not significant but ….. well … “it contributes to” is a term we’ve all heard before. Anyway, my aluminum porch awning reflects the sun (both top and the side in the afternoon) and heats the brick up an additional 10 – 15 F over the course of several feet from the awning. Ahh …. the curious wonders of an IR thermometer and a water hose for cooling the side of your house. A little chart to record the measurements and …… well …. soon to measure everything including the dog’s fur! I love citizen science! I’ve lusted after a high quality IR thermometer for years, but it’s just not in the budget. I came thaaaat close to buying a surplus geiger counter a few years back, but other priorities popped up – like just before I ordered it, the refrigerator failed – it was jealousy I’m sure! The IR meter is a neat gadget with practical use. I sure beats the meat thermometer that I used 20 years ago and ladder and holes drilled in brick to measure temp. Have recorded internal brick temps at avg of 145 – 160 F on full sun afternoon. IR meter is a bit more convenient. Water down brick @ about 115 F and a couple more times at 1 hour intervals does the trick. Fabbed 1/2″ pvc w/ small holes to mount house to water but that is now used in garden for irrigation. Need motivation to get more pipe. A few more hot days ‘otta do it! A decent cheap IR thermometer is available for $40 -$50 online. I usually go for mid-range pricing/quality unless I need pinpoint accuracy in any tools. I’d recommend the Kintrex irt0421 thermometer, but they may be out of business. Beyond that, I’d recommend getting one with good low-end response, as that’s a bit of a challenge to do well and and using it to measure downwelling IR (not really temperature at that point) is very interesting and correlates with water vapor. The one I have is a 12/1 cone w/ adjustable emissivity range. Per your link the Omega OS-425 has a 50/1 cone. It’s quite a bit more expensive but if I had the $$$$$ it may have better suit my ultimate need/desire. Anyway, when you start playing around with it using calibrated thermometers, thermocouples, and the new toy IR meter ‘ya gotta watch out for the IR in all its forms. They all somewhat agree in the predawn darkness but the neighbors house across the street will mess with ya. There seems to be some effect from the sky as it begins to lighten. I’ll be checking all that out as soon as I get some more aluminum fol. Day before it was 96F outside and the GPU on my video card was 135F. The 2PM and 3PM readings show that it was Mostly Cloudy. Don’t clouds blocking the sun tend to cool temps down during the day? I 100% understand why this record is in the GHCN – it shows a solid 1.2+ deg C heating since 1960! How could you possibly let an increasing record NOT be included in the GHCN? There’s a story to be told, and this just makes it easier! You can get a total of 40 for free by registering. Not only WaPo, also Dutch RTL TV weather, it was stated that the old record of 55 °C in Tunisia 1931 was not valid. In 2012 the all-time high in Libya of 58 °C in 1922 was already deleted from the records as unreliable. It’s hot in the Sahara Desert. Film at 11. It seems to be difficult to beat the 1913 56 C record from Death Valley. Even though the Death Valley station has been moved downhill to Badwater and sited in a cul-de-sac open to the afternoon sun but surrounded by rocks for maximum irradiation effect. However satellite measurements of ground temperature shows two areas where these reach 70 C fairly regularly, inland Pilbarra in West Australia and central Dasht-e-Lut desert in Iran. Even though temperatures at 1.5 meter height will be lower due to convection it would seem that these areas would have the best chances of setting a new record. However there is an extreme lack of people and weather stations in both areas. Surely NOAA or CSIRO or somebody could pay for a number of unmanned stations there to generate good scare stories? I’d prefer a Mann’d station. It is only 25m from a tall light-blue coloured building with a rather grandiose entrance and palm trees. Given the climate, this will almost certainly be well-equipped with air-conditioners. It is only 40m from an asphalt dual-carriageway, and only 50m from the very edge of the terminal apron. Also, I doubt the validity of comparing records from automatic measurements with those from older manual readings. It should be straight forward to check if there was bias. Unfortunately, not a lot to choose from in that location. It was an all time high for THAT location. (Assuming the reading to be correct). Isn’t this comparable to Alarmists, politicians, and the media (I repeat myself) touting a “100 year” flood or drought or whatever to the gullible public who naively assume that means such an event would only occur once in 100 years across the entire world? Of course it is once in a 100 years for THAT “micro” weather reporting zone. We had a “100 year” 12 hour total rainfall several years back when I lived in western NY that caused extensive erosion and property damage to me and my immediate neighbors but most of the other parts of our small county only got wet. I don’t know how many of those weather zones exist in the world or even if there is formal accounting of them. But if there were, the number has to be in the millions, and thus statistically is it not likely that in any one day SOME LOCATION has experienced a hundred year event (including a temperature spike}? Spring is the hottest season in India/Pakistan, before the monsoon starts. Many stations have May or even April as the hottest month, virtually none have July, as is usual elsewhere in the Northern Hemisphere. …the recent all time high in Scotland that turned out to be polluted by an idling vehicle producing hot exhaust near the temperature sensor…. This adds to a remarkable onslaught of all-time heat records set around the planet over the last ten days. Every year there will be a number of hot and cold records. The CAGW alarmists will report the hot records as if they are unusual. They aren’t. The alarmists will ignore cold temperature records dropping like snowflakes. link I continue to be skeptical because I simply do not trust the alarmists to tell the whole unvarnished truth. Dr. Michael Mann’s attempt to erase the MWP with his hockey stick turned me into a skeptic. Since then it’s been one sad piece of crap after another. The left wing and the MSM paint The Donald as a liar. He doesn’t hold a candle to them. I hear they make a mean salad there, in Ouargla. What, you’ve never heard of Ouargla salad? A record temperature during a modern warm period. Meh. A few tens of thousands years from now that record temperature at that location will not be detectable. It is likely the case that in past warm periods over the last 800,000 years, records would have been recorded as freqently as they have been now, were the technology available. > Ouargla, with a population of nearly half a million, is located in north central Algeria, roughly midway between Morocco and Tunisia. In Seattle, they use SeaTac airport as the record of choice, regardless of what it’s doing all around it. NOAA’s NCDC database puts the station at 47.4444°, -122.3138°, which on Google Maps puts it smack in the middle of all the runways. Just plug that number into Google maps and you’ll see it. The resolution on GM was too low for me to make out any individual structures, but there are several likely candidates. I also looked at a little history. I looked at the June data for 1948, and 2018. not a lot of difference just eyeballing it. At the bottom of each generated PDF of the historical data it has a Summary field, which I assume means average. Here are the max/min averages for the month. What does it mean? Probably nothing. But I’m sure not scared by it. This so clearly brings into question the ultimate meaning of a “global average temperature”. With humans occupying much of the land, how is it that we can disqualify human cities from being places to measure temperature? Are cities not where humans live MOST OF THE TIME ? Are temperatures of cities and temperatures surrounding our built structures not the temperatures in which humans live most of the time? Do standardized temperature locations really have any meaning at all, compared to what humans generally experience most of the time ? The temperatures in which humans live ARE the temperatures of their cities and places with their built structures. We are already living in places where the temperature is above any anomaly based on any standardized-measuring-station determination. Humans are now very much a part of the Earth scene, contributing to small increments in temperatures of their living spaces that “global average temperature” is engineered to ignore. A “global average temperature”, as determined by idealized, perfectly located measuring stations, NOT influenced by human structures, is a total fantasy. We live in the temperatures that our structures create in association with the natural structures of the Earth. When we compare a global temperature anomaly, figured from ideally located stations, and then freak out because of a fraction of a degree, why are we not freaking out about the possibly MULTIPLE degrees higher temperature that we already live in because of our structures? Those ideal anomalies do NOT reflect our actual living temperatures in our cities where we are ALREADY experiencing much more than the idealized anomaly of increase. Even within the natural structures of the Earth, the temperature can differ by small amounts in the same general area, which reduces the idea of a small anomaly to a non-physically-based idea. During the summer most of my time is spent inside of buildings where air-conditioning keeps the temperature in the low 70s F.
During the winter most of my time is spent inside of buildings where heating keeps the temperature in the low 70s F.
I guess my average global temperature is somewhere in the low 70s F.
Even without the ice cream truck, the Scottish record would have been invalid because of the extremely bad conditions in the immediate vicinity of the sensor. But it wasn’t. One would have assumed its siting issues would have disqualified it immediately, but there’s no indication the Met Office would have done that. Well, that sure explains NASA GISS. The commenters over at WaPo are true believers, preparing for the heat apocalypse. I am always amazed that they become so upset by this kind of report. GOODNESS ME ! FANCY IT BEING HOT IN ALGERIA ?????? IT MUST HAVE SOMETHING TO DO WITH THE WEATHER perhaps !??? All this record stuff was kind of cute when Guiness did it. Not so much when politicians and the media do it to cause panic. Records are great for book you want to hawk…. Only the dumbest people still believe anything from this pathetic rag. They have been caught lying countless times. Why is it unfortunate? Does the Met Office want a high temperature? You’re referring to the Scotland incident in a pair of other posts. This one likely involves a large airplane. The highest official temperature ever recorded in my hometown Lewiston, Idaho (only a couple hundred miles from Canada) was 115 f. That was just set in [drum roll] … 1962. Proof the world has been cooling for 55+ years. Was that temp recorded in the valley where the steep Lewiston Hill to the north almost acts like a reflective oven on the entire valley; or was it recorded at the higher elevation at the airport in the Lewiston Orchards? It was almost certainly recorded at the former NWS station at the airport. Down on Main St it would have been much hotter. Our family drove that day in a 1960 Chevy to spend several days at Zim’s Plunge, the hot springs resort in central Idaho! My dad borrowed a window mounted swamp cooler, but it was useless. Meanwhile South Africa is getting snow, some in places that have never had it. Sheesh! I can understand why skepticism is warranted, but saying it should be disqualified based on guesses and suspicions is a little much. Are there any other stations near enough to compare temperature patterns? Does the record appear to generally have anomalous temperatures at the station? Are temps higher when the wind is from the southwest? According to Weather Underground, at 3 p.m. the wind was SSW, not WSW; according to the SYNOP report it was WNW. Regardless, the temps were evidently very high for an extended period no matter what wind direction was recorded. And it’s not in the runway approach area. The typo in the wind direction has been corrected. Thanks. The typo doesn’t change the conclusions of the essay. So what? The issue is the high temperature record, not that it gets very hot in the summer in the middle of the desert in Algeria, it’s the accuracy of the high temperature record. Classic deflection on your part. And I’ve published a study showing that temperatures have in fact been systematically biased upwards by such problems. What have you published to counter such concerns? Also, you may not understand what a “runway approach” is. It is in fact within the approach area of runway 20. Anthony, please don’t misunderstand – I agree that the record temp is suspect, but I disagree with the idea that it should simply be thrown out based on the evidence you provided, which contains some guesses and assumptions. I do agree that the WaPo article jumped the gun. I don’t doubt that there are station siting problems (the Roman example is a good one), but that has absolutely nothing to do with whether the record temperature recorded here is false. The fact that the whole afternoon had very high temps is not irrelevant, and it wasn’t a “deflection” on my part. However, I understand your point. “Also, you may not understand what a “runway approach” is. It is in fact within the approach area of runway 20.” I guess part of the problem here is that “area” is pretty vague. Judging by the distance and patterns on the soil, I wonder how significant a problem this really is. I had seen your work before, and also the response from NOAA (https://www.ncdc.noaa.gov/ushcn/station-siting). Why should I have to publish anything to counter your concerns in order to voice an opinion? Your concerns are legitimate. Your (and others’) work was valuable and an admirable effort, at the very least because it instigated a closer look by NOAA at their data. That said, I’m not sure the data are as faulty as you suggest, or that “the NOAA/NCDC homogenization adjustment causes well sited stations to be adjusted upwards to match the trends of poorly sited stations” – but I emphasize that I’m not sure, meaning I withhold judgment. P.S. Usually you give a h/t to those who find errors, don’t you? It wasn’t just a typo – you used it to orient your arrow. I noticed the slight, but no big deal. Your decision. Understandable – it’s people like me you are fighting. P.P.S. Is north not toward the top of the image? Funny how the arrow on the graph doesn’t agree with the reading. And why choose 3 p.m. for your wind direction, rather than 4, when it was from the SE or WNW, depending on which you believe? To me the wind direction is not good evidence to use here based on the inconsistent readings and not knowing when the high was reached. It is this kind of thing that makes alarm bells ring, making me wonder how dispassionately you view the data. I’m not picking on you -no human reasons well all the time, myself included. The best scientists (I am NOT included!) are always mindful of potential for bias – it’s the only way to counteract it. I’d certainly be curious to know where the nearest “ideal” station is, and if it is very close, how it compares. I think it would be interesting to compare a list of known sites that may be compromised, that have un-compromised stations close by, to see the range of the differences between them. Obviously, this is not always possible, but I still think it would be useful to get a handle on the magnitude of the problem, and to build up a picture of how much difference is made by the many different ways a station may be compromised. The nearest site (though I don’t know how “ideal” it is) is OUED IRARA, AG (in Haoud El Hamra . The high there was 121 F that day, according to NOAA. Also according to NOAA (I just got the official results – it took them longer to process the temp there for some reason, maybe because they were double checking it? Who knows?) the high at Ouargla was 124 F. The stations appear to be about 80 km apart. OH NO!! The desert is hot, hot, hot! There is a roadside automatic weather station on east bound interstate 1976 east of Denver high in the hills. have of the station hangs over a guard rail that is for a bridge. Do they use these roadside AWS for calculating global temperature? Just look at the small area for the jet above, it has to make a 360 rotation and that spews jet exhaust everywhere. Sure? What good is 360 rotation for.